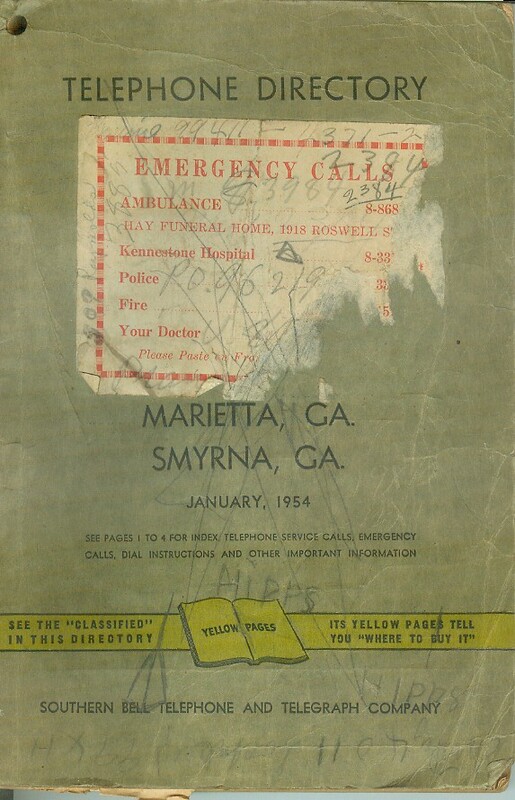 Yesterday we gained possession of an old 1954 Marietta telephone book. The book has 75 pages of pages (not counting the yellow page section) and was in large print. The book was used actively when I was about 13 years old. I looked up several people that I ran around with or was related to and to see their old addresses and their old telephone numbers. Seeing each old brought back familiarity. And also, flipping through the yellow pages seeing the ads of businesses that are long gone and almost forgotten… My father's name was listed as living on Manget Street. 1954, the same year of the phone book was the year we moved from Manget. 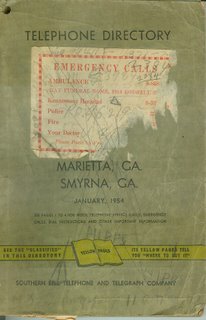 The telephone number was the same as it is today, except now all numbers have a prefix of the area code, because there are 3 area codes in Metro Atlanta. it was like a time machine visit to the past. Also, when looking at something like this it may stir up some questions you did not know to ask. For instance, it showed my uncle living on Blackwell Road. He did not live on Blackwell Road, he lived on Ebenezer Road about a third of a mile from the Blackwell Road intersection. I wonder why he was listed as living on a road he did not live on, but fairly close to? I guess the best and easiest answer would be: Who cares? Now, the latest Marietta telephone book has 764 pages of small plus the yellow pages. That is much more than ten times larger than the 1954 book. does it have all those weird numbers like "Clondike 54?" I always wondered what those were- not being around back then.....thats pretty cool that you have that. The only prefix I have seen while flipping around was that our neighboring town Smyrna has HE for Hemlock. Why have a poison as a telephone prefix? So these prefixes were assigned to towns back then? I assume the companies were localized???? Smyrna is between Marietta and Atlanta. We could call Smyrna without paying long distance fee and there were no long distance charges between Smyrna and Atlanta. I have a friend back then, he had to call his grandmother is Smyrna and had her relay a message to his mother working in Atlanta. And his mother would do the same, call her mother in Smyrna and she relayed the information to my friend Sam. Of course, I know that doesn't explain if the Southern Bell local offices were localized or not, but interesting anyway.